When you are faced with a medical emergency, dial 911 or head to the nearest emergency room. But what should you do if you have a dental emergency? Can the local hospital take care of that, too? Chances are the answer to that question is no. The doctors and nurses may be able to provide pain relief and antibiotics, but they do not have the training required for emergency dental care. For that you’ll need to see a dentist. So if you or a loved one needs urgent dental care, such as for an emergency tooth extraction 43725, be sure to contact a dentist right away. Estimates are that more than 800,000 Americans will go to the ER this year for a dental emergency. Although a hospital ER is certainly the place to go for a broken bone, a deep cut or symptoms of a heart attack, it simply is not equipped to handle a knocked out tooth, a fractured tooth or a tooth needing immediate extraction. Going to the ER for any of these dental conditions will not only leave the situation mostly untreated, but will also cost a pretty penny. In addition to the ER bill, you’ll also have to pay a dentist or oral surgeon for the appropriate treatment. Now you know that an ER is not the place to go in case of a dental emergency. Is there a way to avoid having a dental emergency in the first place? Yes. In most instances, a dental emergency could have been avoided simply by seeing your dentist for regular dental checkups. Preventive dentistry guards against a costly trip to the ER, which can cost as much if not more than a few years of checkups. These twice-yearly visits aren’t just for teeth cleaning. They also give the dentist a chance to catch a problem—decay, a cracked tooth, a loose filling—before the situation becomes serious. If your emergency involves a traumatic facial injury that is causing severe swelling, bleeding or a possible broken jaw, then you should go to an emergency room before seeing your dentist. However, if you’ve had a mild toothache for a while that has become severe, call your dentist right away. A toothache could be a sign of serious infection. Your dentist can prescribe an antibiotic and pain medication, and he will probably want to see you as soon as possible for treatment. 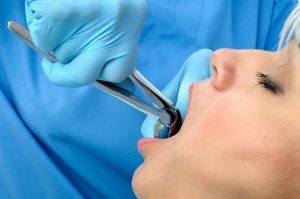 You never know if a painful tooth may require emergency tooth extraction in Cambridge, so please contact your oral surgeon for care that you cannot receive in an ER. Dr. Jeff Lee is a dental implant dentist and certified oral and maxillofacial surgeon based in Cambridge, OH. At his practice, he helps patients who are in the midst of different dental emergencies. You can contact him through his website.